With an immaculate interior decor, beautiful dreamy lights, chic furniture and fabulous live music, the Goodbar Goodburger will offer you the best burgers in town. 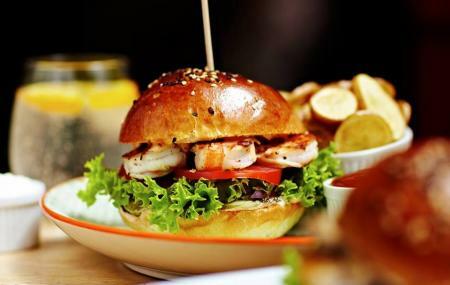 Apart from their signature jumbo burger, you will find a plenty of other options such as Bar Food, Eloetelek Salatak, Burgerek, Koretek, Desszertek and Szoszok Feltetek. You will find great variety on tea, coffee, lemonade, beers, cidars, shake, soft drinks, wine, cocktails, champagne, fruit spirits, gin, rum, whiskey, vermouth, vodka, tequila, cognac and so on. Winter special hot chocolate, mulled wine and apple grog are also awesome. Create a flawless plan, make use of Budapest trip planner. You can enjoy a comfortable stay in the city by booking the best hotels in Budapest like Hotel Charles, Burg Hotel and Hotel Orion VÃÃÃ‚ƒÂ¡rkert. If you want to add the visit to Goodbar - Goodburger in your trip, you can choose from the variety of Budapest vacation packages that can be designed to suit your preferences. These packages also cover your major concern of how to reach Budapest. How popular is Goodbar - Goodburger? People normally club together Manuel Caffe - M. Kave Import Kft and Corvinus University Of Budapest while planning their visit to Goodbar - Goodburger. Fast and friendly staff, the quality of the food is very good. The place has a nice atmosphere. I ordered hot chocolate which was great. The burger was delicious and juicy. The vegetables were fresh and crispy. Great attention for details. Recommended! Exactly what it says on the tin. Burgers are nice beers are decent and service also pretty good. A little on the pricey side with Hungarian standards but still well worth it. Sidenote it's a dog friendly place despite the fact you can eat here, just in case this matters to you one or the other way. Good food and good service. We really liked the hone made lemonade and the local beer. The food was tasty and came fast. Very friendly vibe. Open till 11 pm, kitchen closes at 10,30. Good burgers and nice beers. Waiters very nice with good English. I was expecting more from my Duck Burger, yet good experience at the end.